Four scientists who have made significant contributions to ongoing research at the U.S. Department of Energy's (DOE) Brookhaven National Laboratory were among those recently named Fellows of the American Physical Society (APS), the world's second-largest organization of physicists. Election to APS Fellowship is limited to no more than one half of one percent of its membership in a given year, and election for this honor indicates recognition by scientific peers for exceptional contributions to physics. The contributions of each new Fellow-Oleg Gang, Mary Bishai, Abhay Deshpande, and Mei Bai-are featured below. "For demonstrating and developing the principles of programmable self-assembly of polymer-based nanostructures and for elucidating the physical origin of their assembly behavior." There's no easy way to build materials at the nanoscale-a world of individual atoms and materials so small they are measured in billionths of a meter. Some advanced materials with special atomic arrangements have unique properties that could lead to better solar panels, fuel cells, medical treatments, and more, so the challenges are worth overcoming. Oleg Gang is a scientist at the Center for Functional Nanomaterials (CFN), a DOE Office of Science User Facility at Brookhaven Lab, and he has developed ways to use long chains of synthetic DNA as "programmable glue" that encourages specific nanoparticles to bond to together in a desired way, assembling themselves into larger scale, three-dimensional, well-ordered structures. Gang relies on highly specialized tools and techniques at the CFN to create these materials and, after years of studying them at the National Synchrotron Light Source (NSLS), later this year he will begin probing their structures and behaviors with several beamlines at NSLS-II, which will provide x-rays 10,000 brighter than its predecessor. Gang, who lives in Setauket, joined the CFN in 2002 as a Lab Goldhaber Fellow-a distinguished fellowship awarded to candidates with exceptional talent and credentials who have a strong desire for independent research at the frontiers of their fields. He earned a Ph.D. in soft matter physics from Bar-Ilan University in 2000 and was a Rothschild Fellow at Harvard University from 1999 to 2002. Gang has led the CFN's Soft and Biological Nanomaterials Theme Group since 2006, and he has received numerous honors and recognitions, including the 2010 Gordon Battelle Prize for Scientific Discovery. "For her contributions to flavor physics, including analysis of the NuMI/MINOS neutrino beam, leadership of the accelerator neutrino program, and contributions to understanding of the b-quark." The Standard Model of particle physics is the theory that identifies and explains interactions among all known elementary particles such as quarks, neutrinos, and their different species or "flavors." The theory, however, is incomplete and does not explain all experiment data observed to date, including the discovery that neutrino masses' are not zero, as previously thought. Precision tests of Standard Model predictions and neutrino properties can potentially reveal the new physics beyond our current understanding. Physicist Mary Bishai had a critical role in the Main Injector Neutrino Oscillation Search (MINOS) experiment that led to the most precise measurements to date of the mass difference between two of the three neutrino flavors in the Standard Model. As the beam systematics coordinator, she developed simulations to accurately predict the number of neutrino events detected among those produced by the proton accelerator complex at DOE's Fermilab. Bishai co-led the effort to formulate the scientific program for the Long Baseline Neutrino Experiment (LBNE)-a massive effort now being reformulated into a large multinational collaboration to use neutrinos to understand why matter dominates anti-matter in the observed universe-and as project scientist for the LBNE, she made critical contributions for design decisions. As a research associate, Bishai and her collaborators also verified a tenet of the theory of "quantum chromodynamics" by measuring the total production rate for the Standard Model's b-quark particles from protons colliding with antiprotons at the Tevatron facility at Fermilab. Bishai was the principal author for the well-known paper that described these results. Bishai, who lives in Mastic, arrived in the Physics Department at Brookhaven Lab in 2004 and was awarded tenure in 2010. Before her time at the Lab, she earned a Ph.D in experimental high-energy physics at Purdue University in 1999 and was a research associate at Fermilab from 1998 to 2004. She is also a member of DOE's High Energy Physics Advisory Panel, which advises the federal government on the national program in experimental and theoretical high energy physics. "For his sustained effort and leadership in experimental programs to understand the nucleons' spin, employing polarized DIS experiments at CERN to high-energy polarized proton collisions at RHIC (with PHENIX detector), including early development of beam polarimetry and other essential tools; and for his leadership in the efforts toward realizing the future US electron ion collider." The great "proton spin crisis" arose in the late 1980s, when, contrary to the physics community's prevailing expectations, experiment results showed that the proton's spin property is not equal to the sum of contributions from its subatomic quark and anti-quark constituents. This mystery of the "missing spin" has yet to be solved, but scientists are on the case with data from polarized proton collisions at RHIC, the only collider in the world capable of smashing polarized protons-protons spinning with their axes pointing in the same direction. One of the scientists focused on the proton spin crisis is Abhay Deshpande, a physics professor at Stony Brook University and deputy experimental group leader for the RIKEN BNL Research Center (RBRC)-a physics research center located at Brookhaven Lab and formed by an international collaboration between the Lab and RIKEN, Japan's Institute of Physical and Chemical Research. Deshpande's earlier experiments to investigate the proton's missing spin took place at CERN, colliding a beam of polarized muons with polarized protons and deuterons in fixed targets. His pursuit of understanding the missing spin then brought him to RHIC to measure the gluon's contribution to the proton's spin. There, he and his collaborators also developed complementary tools, including one used to identify the actual percentage of protons properly polarized among billions in a collision-bound particle beam. 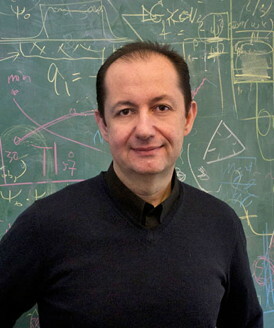 Recently, Desphande was also co-chair for an international committee that produced a whitepaper about a proposed electron-ion collider, where physicists could probe even deeper into the proton's inner structure of quarks and gluons. Before his current roles as a professor of physics at Stony Brook University and deputy experimental group leader for the RBRC, Deshpande earned a Ph.D. in experimental high energy physics at Yale University in 1995 and completed a master's program in physics at Indian Institute of Technology in India in 1987. A resident of Miller Place, he was an RBRC fellow from 2000 to 2007 and joined Stony Brook University as an assistant professor in 2004. There, he was made an associate professor with tenure in 2008 and was director of undergraduate studies for the Physics and Astronomy Department from 2010 to 2014. "For outstanding contributions to the dynamics of spin-polarized beams and the acceleration of polarized protons for the first high energy polarized proton collider." The Relativistic Heavy Ion Collider (RHIC), a DOE Office of Science User Facility at Brookhaven Lab, is the only particle collider in the United States and the only facility in the world capable of colliding polarized protons-protons spinning with their axes pointing in the same direction. Researchers from around the world rely on this machine as they work to address the "proton spin crisis," hunting for an explanation as to why the proton's spin is not equal to the sum of the spins of its parts. Before operations began at RHIC, Bai and collaborators developed a method to keep protons polarized in an accelerating beam, and the technique was demonstrated successfully at the Lab's Alternating Gradient Synchrotron, an important piece of RHIC's accelerator complex and home to three of Brookhaven Lab's seven Nobel Prize-winning discoveries. In 2004, 2005, and 2009, Bai was the RHIC polarized proton run coordinator. As such she was responsible for ensuring that all accelerator systems were working optimally, as well as developing and implementing plans to commission new program aspects and continuing performance improvements. Her most recent work at the Lab involved developing a "spin flipper," which will reduce systematic experimental errors, and optics corrections to improve performance for all ion species that collide at RHIC. Bai earned a master's degree in physics from the University of Science and Technology in Hefei, China, in 1992, and a Ph.D. in physics from Indiana University in 1999. She joined Brookhaven Lab in 1999 as a research associate in the RHIC Accelerator Physics Group, and rose through the ranks before being awarded tenure in 2009 and named deputy accelerator physics head. The American Physical Society recognized Bai with its Outstanding Doctoral Thesis Research in Beam Physics Award in 2000, and in 2010 the Asian Committee for Future Accelerators presented her with an early career prize. Bai recently became director of large-scale nuclear physics equipment (called "IKP-4") at the Nuclear Physics Institute of Forschungszentrum Jülich in Germany, where she continues pursuing new insights to understand more about the mysteries of our universe.